In 1985, a young and homeless Lawrence Krisna Parker (aka KRS-One) met social worker Scott Sterling (Producer/DJ Scott La Rock) at a Bronx shelter. They hooked up with (uncredited) producer Ced Gee from the Ultramagnetic MC's to cut ''South Bronx'' and ''The Bridge Is Over,'' monumental records which toppled the Queens-based Juice Crew and forever cemented the Bronx's place in the history of hip-hop. These tracks, along with the sublime ''Poetry'' and the shocking ''9mm Goes Bang,'' formed the basis of the now classic full length Criminal Minded. 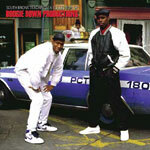 As the record took off, Scott La Rock was killed in a street-side shooting while coming to the aid of BDP rapper/producer/ protege D-Nice. From the now out-of-print compilation, The Man and His Music, this CD adds a DJ Red Alert megamix, circa late '80s, and the early tracks, ''Advance'' and ''D-Nice Rocks the House.'' Also included is the rare early single ''Say No Brother.'' This limited package also features uber rare unpublished photographs of KRS with Scott taken by Janette Bekman but never used in the original The Man and His Music packaging.